Proper tree removal, in its own right, can be a challenging and daunting task. This is a process that must be carried out with caution and care, particularly for the safety of any persons or property in the immediate area. Comparatively speaking, however, removal of the main/visible portion of the tree might be less daunting than tackling what remains behind – that is, what is the best way to remove the stump? 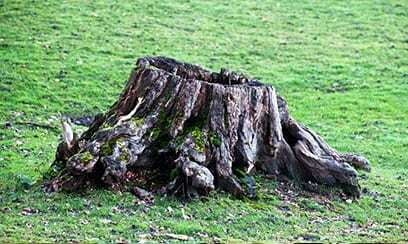 A tree stump consists of the small section of trunk left above the surface plus the roots that remain underground after the tree has been felled. Depending on any number of factors, removal can be difficult – and potentially costly. In essence, there are 5 possible ways/methods to perform tree stump removal. Each method has applicability in certain types of situations, along with associated precautions plus varying timeframes for the desired result to take effect. Chemicals may be a fairly economical approach, notably in cases where multiple stumps need to be removed simultaneously. These products will also speed up the decaying process, however, their associated safety and soil contamination concerns may prevent this method from being the initial choice of many homeowners. Individuals who are not averse to some physical labour may opt to remove a stump by manual means. Others who would perhaps prefer a faster and more efficient way might consider hiring a professional stump removal service, such as DreamWorks Tree Services, to grind the stumps, particularly in physical settings with access that is restrictive or more delicate in nature. There are many reasons why a tree or trees may need to be felled, ranging from the installation of a swimming pool or a building extension, to disease/infestation, to safety concerns. Whatever the circumstances, the removal process is truly not complete until the tree stump has been extricated as well. If you are uncertain about performing tree stump removal safely on your own, or how best to proceed in your specific situation, call the tree care specialists at DreamWorks Tree Services today at 647-261-2627 or 1-800-407-9917 or contact us to arrange a free consultation. Tree stump removal chemicals may be a fairly economical approach, notably in cases where multiple stumps need to be removed simultaneously. These products will also speed up the decaying process, however, their associated safety and soil contamination concerns may prevent this method from being the initial choice of many homeowners.